The city is situated in the Marmursk hollow, where river Rika (the name of the river in Ukrainian means “river”) falls into river Tysa. The city was founded in XI century. In 1329 the city got the rights of a crowned city. In 1511 it was rented to the family of Pereny. 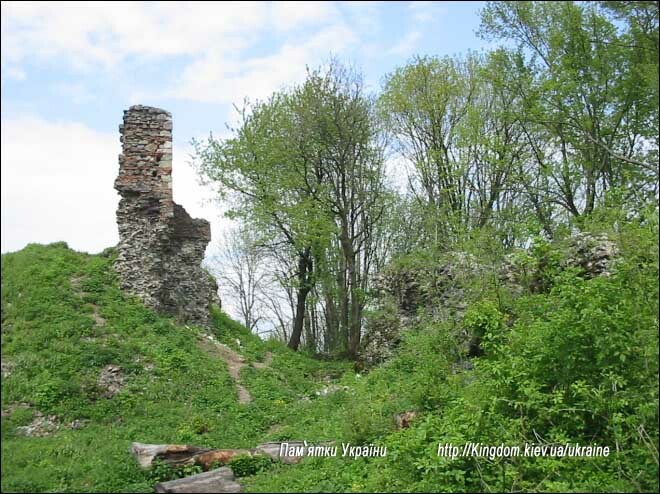 In XVI–XVII centuries the city and its castle were often fought for by the Gagsburgs and the Semigorodsk princes, as well as Turks and Tatars often to devastate the area. During January 1919 there was held the Transcarpathian meeting, where it was established to unite Ukraine. 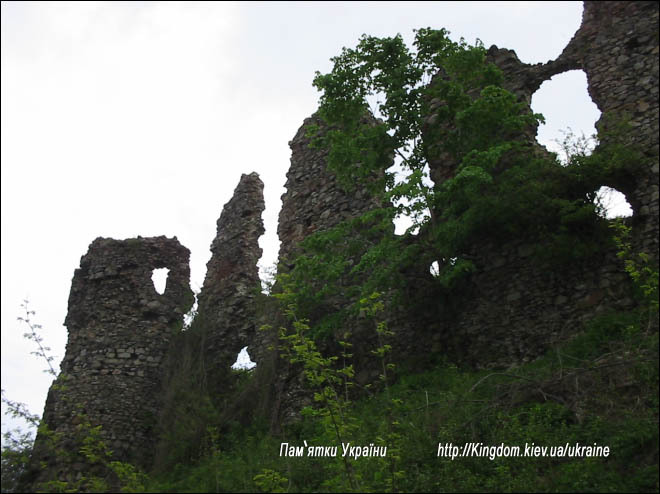 From 1938 it became the capital of the Carpathian Ukraine. In March of 1939 here used to work the government of Voloshin, and this is the place where the independence of Carpathian Ukraine was proclaimed. "… Long ago deuces used to carry mountains from one place to another. So one of them took up the mountain, on which the remains of the Hust castle stand now,and wanted to carry it to another place. As the mountain was too heavy, soon the devil decided to take a rest and put the mountain down. In the meantime another deuce was passing by, and the mountain, being put down, has accidentally squished his tail. So he started shouting : "Oh, oh, my tail, my tail!" (in old-Ukrainian the word “tail” sounded like “huist”). The other deuces heard that and ran up to help him get his tail away from the mountain. The poor deuce got very happy after getting his tail free and went away. The other one, who carried the mountain, picked it up and brought to the place, where it stands till nowadays. Since then the name of the place remained “Hust”. "...That was long, long ago, in those times, when the Hust voevode safely lived in his great castle with his numerous servants and warriors. He had not a very big family – his wife and two children. Both of them, boy and girl, had the same birthmarks on their right shoulders. On one day the voevode went on a hunt with his warriors away to the mountains leaving in the castle a small guard. While he was absent, a great disaster happened – the Tatars, who where unknown in that time, attacked the city, and conquered the castle, killing all men and women. They have stolen the young wife of the voevode and his little son Andrew. Only his little daughter could stay alive, because she has hidden in one of the castles lanes. After returning form the hunt, the veovode could find in the devastated castle only his little frightened daughter. He started looking for his wife and son, but without success – they where not to be found. In his great despair he sware solemnly to kill each Tatar to fall in his hands. Years passed. The voevode got old, and his daughter grew up and became a beautiful maid. The voevode knew nothing about the fate of his wife and son. In the meantime his son grew up at court of khan and became a strong youth. The khan paid much attention to him and took him to his personal guard. His mother died soon of despair, and Andrew, or as the Tatars called him – Scandor, was left alone. One day he met among the slaves one of the fathers warriors whom he knew by a scar on his face. The old warrior persuaded him to escape home to the motherland. Their voyage was very hard, but finally they have reached their native lands. Though the castle was far away, it was to be seen. But the old warrior could not go further and died in the arms of Andrew-Scandor. The young man dug out a grave with his sword, buried his fried and continued his trip alone. On his way he heard a scream and saw a girl, who was chased by a bear. That girl was his sister, who went astride on a trip, and has left her supporter far beyond. Her horse got scared of the bear and has dropped the girl down. Andrew rushed to the bear and killed him with a stab in the bear’s heart. During the fight the bear tore down Andrew’s clothes and uncovered his birthmark. Sister has recognized her brother, and they embraced each other, crying. In the meantime the horseman came up and saw the girl, whom he was in love with, embraced with a Tatar. Jealously he hurried to his commander to tell about his daughter to embrace with a Tatar. The angry voevode, true to form, at once ordered his people to cut off the Tatars head. Disregarding the girl’s crying, the warriors caught the young man and brought him to the rock, that stands against the castle over the river Velika (Great), and cut off his head without waiting for the voevode. Soon the voevode came up to the place of execution and after recognizing in the killed young man his son, he killed himself with his sword. 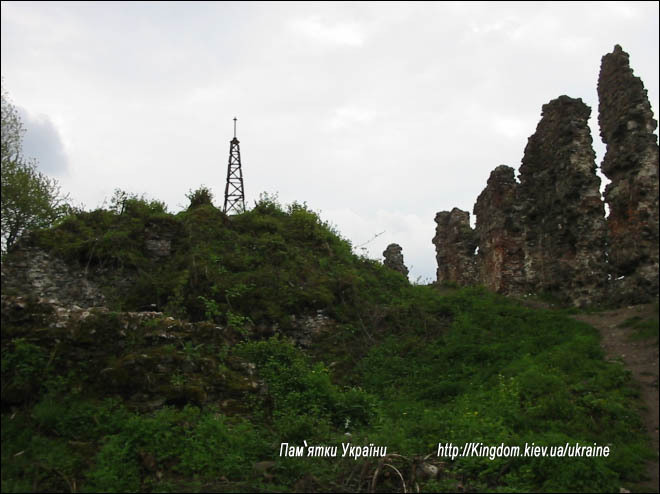 He died on the dead body of his son, their blood has mixed and painted the rock red, that was named after that Chervona (Red)"
On the castle-mountain, that has a volcanic origin, as early as XI century was built a wooden, and later a stone fortress, that could withstand a siege very long. 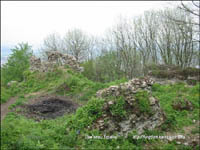 For many times the fortress remained unassasible, and when it was conquered and demolished, the building up again was soon to take place. 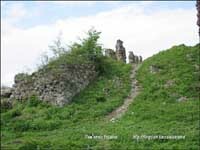 The double walls, the very good place of the fortress – all this is to be considered when you are walking along the road or the paths to the castle. 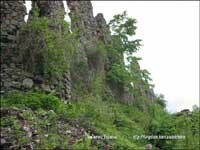 It is hard to imagine, how could an enemy carry along the mountain his weapons and after that lay a siege on the castle. 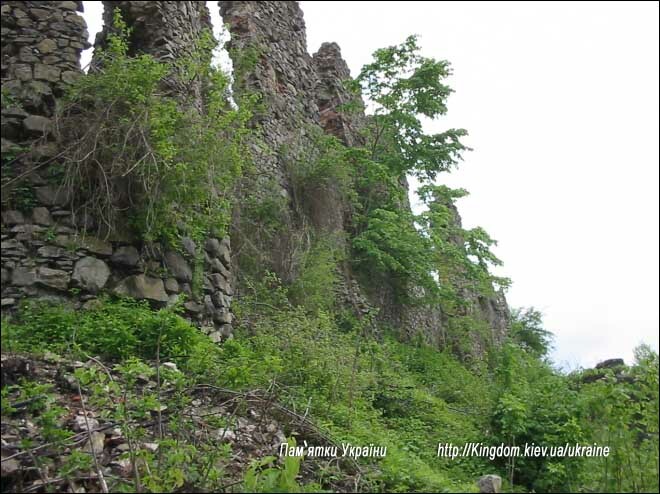 From the year of 1281 till 1321 the castle belonged to the Galytzko-Volinsk princedom. Later it became the property of the Hungarian kingdom. In 1329 the king gave to the city the status of a crowned city (the city could have its own administration, symbolic and other privileges). 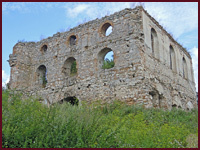 In 1514 the castle was possessed by kuruzi-rebels under the leadership of Djordj Dogi. In 1594 the city was concquered by the Tatars, but the castle was not. 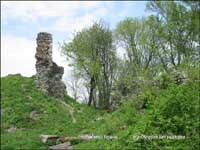 In that time the castle was a powerful fortress that could withstand the Turkish invasion even in 1659. The Turkish traveler and writer Evlij Chelebi wrote: "The castle of Hust is situated on the top of the mountain Hossana, hiss walls are thick and strong, and by his might he is similar to the castle Iscender, as his towers reach the skies". 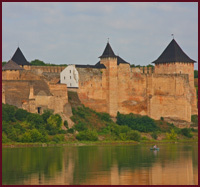 During the Tatars invasions the castle belonged to the Transylvanian princedom. In that time it was in the center of the conflicts between the Gagsburgs and the Semigorods princes. 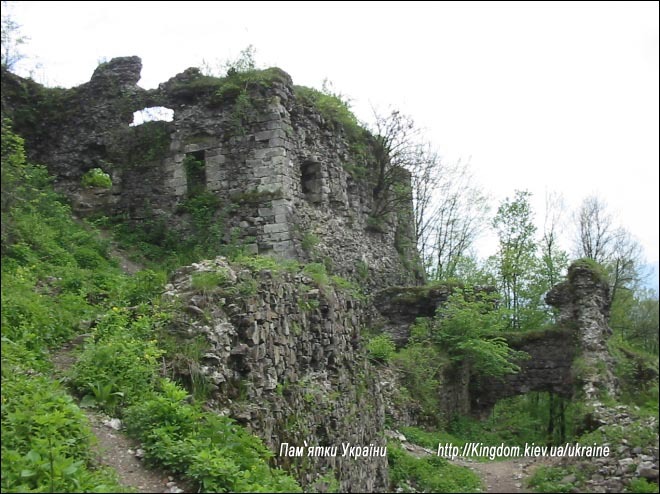 In 1703 the castle was once again possessed by the kuruzi-rebels. 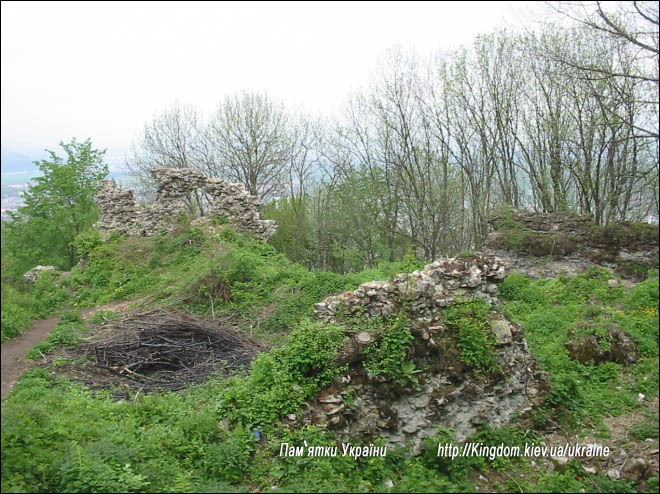 In 1709 Ference Rakoziv on one of the meetings of the Seym gave independence to the castle from the Gagsburgs reign. During all the wars and conflicts the castle was damaged, but quickly built up, but on the 3rd of July 1766 it was destroyed by a lightning, that stroke the powder-keeps. The end-line of the castle has begun. 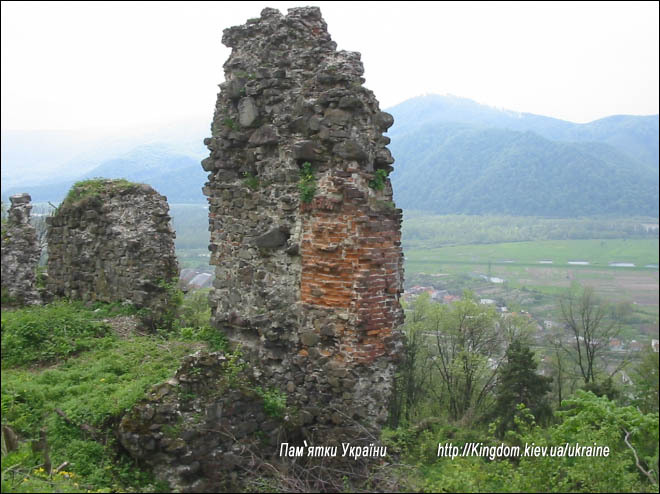 In 7 years during the examination of the castle the future Austrian emperor Joseph ІІ said that the castle was unfit for fortifications. After that in 1788 a great storm with numerous lightnings and strong winds has put the castles life to an end. 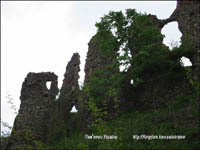 Later the castle was said to be demolished for stones for new buildings. The remains of the castle are a skeleton, picked by the weather and men’s greed. The plan of the castle is to be recognized, if you have a little imagination. But we are unlikely to imagine the whole huge and mighty complex that had two courtyards. It is hard to build up all the buildings on the remaining stones, the number of which becomes smaller and smaller from year to year. 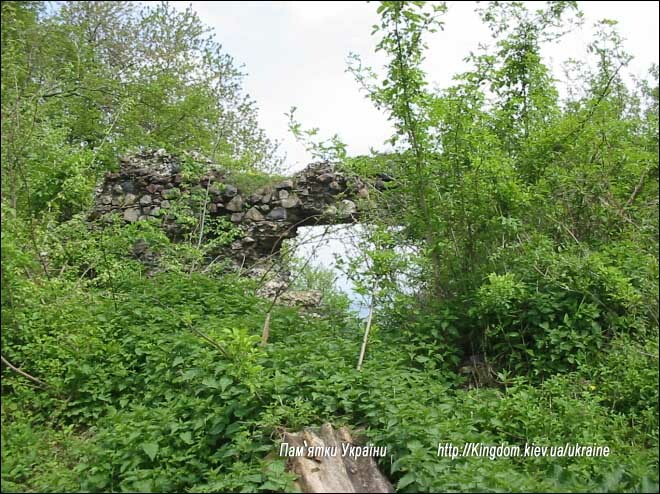 Perhaps, in fifty of hundred years there will be not even one stone, remaining, and in the books we shall read – "…here the rows are still to be seen", "…here stood the main buildings", of course, if the ruins will not be taken under conservation. 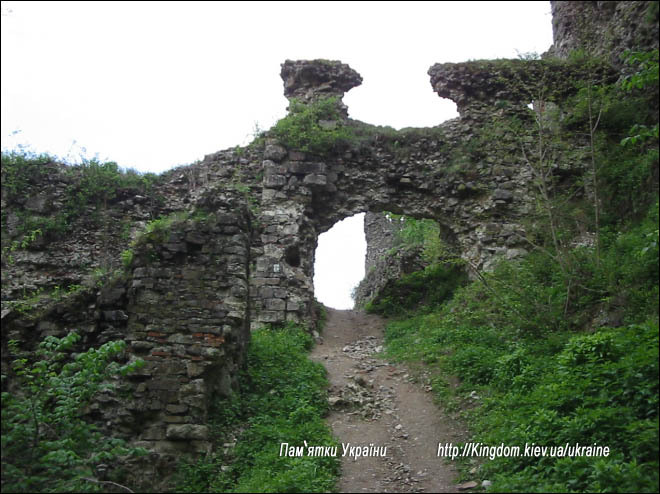 (Taken from "Monuments of town-planning and architecture of Ukrainian SSR" ) "Originally the castle consisted of the upper and the lower courtyards. It was surrounded by walls, and had a south-eastern external entry, and a north-western internal entry. Each entry was strengthened by two towers and had a foot-bridge, thrown over the ditch. On the east side the walls were strengthened by a triangle-tower, on the west and on the north side – by bastions. The triangle eastern tower, that was also used as a training place, where the castle’s biggest fire-arm stood. 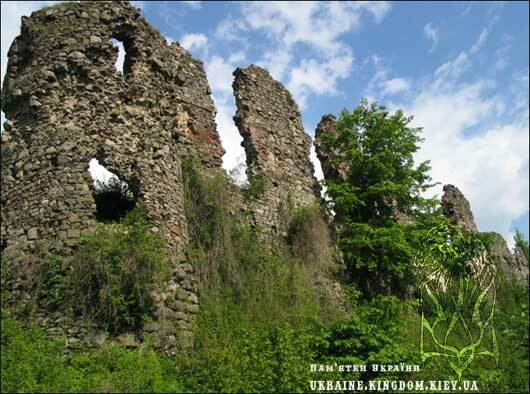 The southern part of the castle was called Ferdinand and was built in 1550. 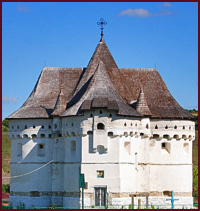 Here stood a cylindrical tower, whose upper part was used, as a keep for the arsenal, the middle part was a chapel, and the lower part was the powder-keep. In the lower courtyard were situated all the economy and living buildings, the jail, the church, the casemates and reservoirs for water. On the upper courtyard there were houses of the castle-owners and commanders, economy buildings, tavern and a well 160 meters deep. The square Patrol Tower protected the north side. 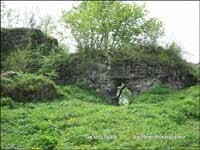 The castle had numerous underground passages. Today the remains of the gates, of the powder-tower, of the bastions and the walls across the castle are still to be seen." 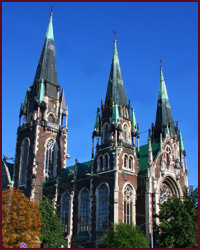 The church is situated on the way from the castle to the center of the city. 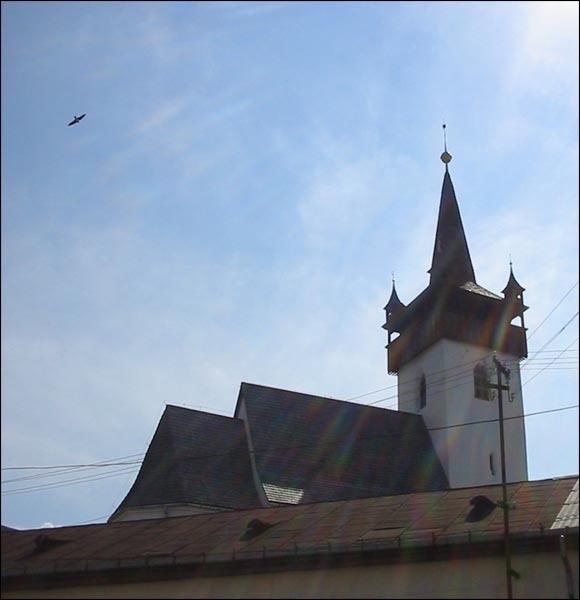 The first church was built in XV century. The church has acquired its modern stone view in XV century. On the western side the church has a belfry that was rebuilt in the XVIII century. The church itself is of gothic architecture – lancet windows, cruciform vaults. The church is hidden behind a wall and has two entrances. But I could not enter it as it was closed. 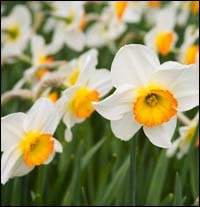 If it is true, that long ago there was a very beautiful, but self-enamoured young man named Narcissus, than this is the only place, where he could have lived together with his gypsies. This fabulous valley is situated in 5 km from the city. At the beginning of May the valley dresses up in lace linen, making an impression of being covered with ice-isles. A beauty like this in nowhere else to be found. Thousands of “green pilgrims” and those, looking for wonders, come to Hust to visit this beautiful valley.